This article was last updated Jul 26, 2018, but some terms and conditions may have changed or are no longer available. For the most accurate and up to date information please consult the terms and conditions found on the issuer website. Students looking for a simple cashback card and the ability to try Amazon Prime Student can benefit from the Deserve® Edu Mastercard for Students. The cashback program is straightforward — no rotating categories or activation required, simply earn 1% unlimited cash back on ALL purchases. Plus, this card has a great Amazon Prime Student subscription offer that can save you a lifetime total of $59. The Deserve® Edu Mastercard for Students earns 1% unlimited cash back on ALL purchases, which is decent for a student card. The cash back you earn is automatically redeemed for a statement credit in increments of $25. Plus, cash back doesn’t expire while your account is open. Amazon Prime Student subscription offer. As long as your account is in good standing, you may be reimbursed for an Amazon Prime Student subscription — with a maximum lifetime total of $59. This is a great perk that can allow you to enjoy the wide range of benefits Amazon Prime provides such as free 2-day shipping, video and music streaming and more. Simple cashback redemption. Cash back is automatically redeemed in increments of $25 for statement credit. That means you don’t have to check your rewards balance for when you can redeem cash back or for redemption options. Beware, the redeemed cash back doesn’t count toward your minimum payment. No intro 0% APR period for purchases. Unfortunately, you won’t be able to benefit from an intro 0% APR on purchases with this card. However, we have a list of the top student cards with many of those cards offering an intro 0% APR period for purchases around six months. Subpar rewards rate. While rewards shouldn’t be your focus with a student card and it’s great to be earning any rewards, the 1% unlimited cash back on ALL purchases isn’t the highest rate in the student card market. You can find student cards that offer higher rates in select categories or other flat-rate cards that reward on-time payments. Cellphone protection*: Pay your monthly cellphone bill with your card, and you may be reimbursed up to $600 for theft or damage of your cellphone. Car rental collision damage waiver*: Rent an eligible car and if it’s damaged or stolen, you may be covered with Master Rental®. Travel assistance services*: You can qualify for legal referrals, medical assistance and more when you travel 50 miles or more from home. Roadside assistance*: Flat tire? Simply call 1-800-Mastercard for towing services, but beware you’re responsible for the cost of services. *You must use your card to qualify for these services. Terms apply. Take this card if you study abroad. The Deserve® Edu Mastercard for Students has no foreign transaction fees, so you can make purchases outside the U.S. without incurring the typical 3% fee other cards may charge. Pay on time and in full. A good habit to get into when you’re new to credit is to pay each statement on time and in full. Payment history is the most important factor of your credit score, weighing in at 35%. By paying on time, you not only help your credit score, but avoid late payment fees, penalty APRs and interest charges. Don’t spend more than 30% of your credit limit. The amount of credit you use divided by your total credit limit is known as your utilization rate. It’s important not to overspend since utilization (or amounts owed) is an important factor of your credit score. To find how much you can spend while maintaining a 30% utilization rate, multiply your credit limit by .30. For example, with a $500 credit limit multiply by .30 and you get $150 as the maximum amount you should spend. If you’re a student looking for a card that allows you to earn high cashback rates in select categories, check out the Discover it® Student Cash Back. 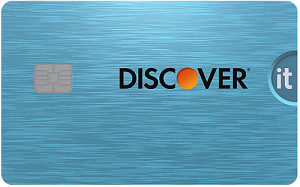 The Discover it® Student Cash Back offers 5% cash back at different places each quarter like gas stations, grocery stores, restaurants, Amazon.com and more up to the quarterly maximum, each time you activate, 1% unlimited cash back on all other purchases - automatically. This is great if you want to utilize the bonus categories, and since they rotate each quarter, there’s a good chance at least one category may suit your spending. Looking at the rewards offered by the Deserve® Edu Mastercard for Students, they’re pretty basic — 1% unlimited cash back on ALL purchases, but may be more beneficial if you don’t want to deal with the activation required with the Discover it® Student Cash Back. If you plan on purchasing school supplies and textbooks, the Discover it® Student Cash Back’s intro 0% for 6 months on purchases (after, 15.24% - 24.24% Variable APR), may come in handy. In comparison, the Deserve® Edu Mastercard for Students lacks an intro 0% period. Rewards 1% unlimited cash back on ALL purchases 5% cash back at different places each quarter like gas stations, grocery stores, restaurants, Amazon.com and more up to the quarterly maximum each time you activate, 1% unlimited cash back on all other purchases - automatically. With its Amazon Prime Student subscription offer and a decent cashback rate, the Deserve® Edu Mastercard for Students is a good choice for students who are beginning their credit journey.